Ramin Gray's Royal Opera production of Gerald Barry's The Importance of Being Earnest was live-streamed from the Barbican on 2 April at 7.25pm BST and was available to watch for 30 days after that. The video is no longer available, but you can hear from the cast about the task of tackling Barry's wild and fantastic music here. 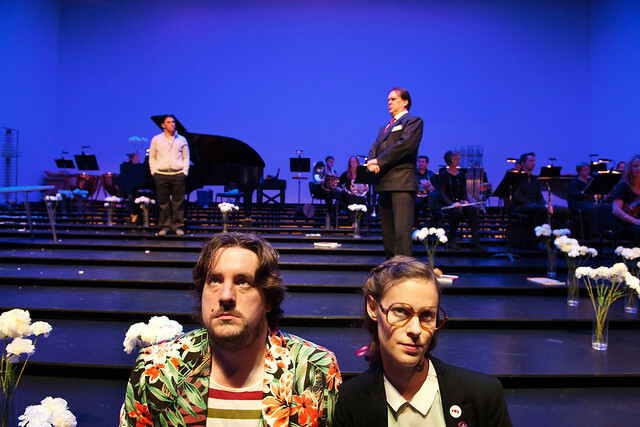 Based on the play by Oscar Wilde, Barry's opera has enchanted audiences since its 2011 concert premiere in Los Angeles, winning the Philharmonic Society’s award for Large-Scale Composition in 2013. Barry re-invents the Victorian farce with a hyperactive score that includes increasingly giddy variations on ‘Auld Lang Syne’ and a battle of spite through megaphones to the accompaniment of 40 solemnly smashed plates. Adapting Wilde's much-loved play was no easy task. Read more about Barry's process here. And we select one of the opera's many madcap highlights in a piece that looks at the Bunburying duet between Algernon and Ernest. Read our Opera Essentials to The Importance of Being Earnest. The live stream of The Importance of Being Earnest is delivered in association with BBC Arts. The Importance of Being Earnest runs 29 March–3 April 2016. Tickets are still available through the Royal Opera House and Barbican websites. Can anyone confirm that the performance will be available to watch on the youtube channel after Saturday? The performance will be made available for catch up on BBC Arts Online and the ROH website shortly after the live stream for 30 days. Will it be available outside the UK? Why does ROH/Barbican consider it not essential to publish the running time for this production- anywhere ? Thank you so much for allowing us to watch this live. My elderly parents would not have made it to a show. They and everyone else I shared the link with loved it! Especially my father, this was his first time watching opera. Am trying to watch on utube but the sound and vision are not synchronised. I think they ate about 5 minutes out. Not worth watching. A pity. It sounds like it might be your connection - have you tried refreshing/reloading the video? Just wanted to ask: Can we still watch this performance somehow?